A war veteran from a retirement property in Whitley Bay has been honoured for his bravery by the French military. George Crawley, 93, from Anchor’s Holly Court in Marine Avenue, was presented with a Legion of Honour Medal for his service on board submarines during the Second World War. 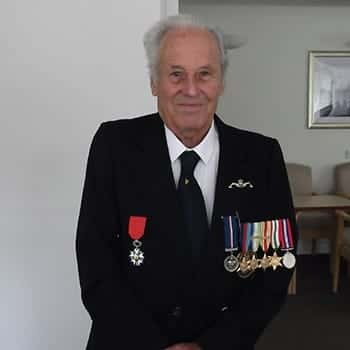 Following the ceremony at HMS Calliope on Saturday (21 July), during which Mr Crawley received the medal from French Brigadier General Hervé Bizeul, tenants at Holly Court held a party for their local hero. Several of the missions Mr Crawley’s submarine was involved with entailed patrolling the ports on the southern French coast, occupied by the Germans, in 1943 and 1944. The crews took photographs of the ports through the submarine’s periscope. Mr Crawley said: “I’m proud to have received this honour and my mum and dad would have been proud, too. I may have the medal, but this is for all submariners. He said the party which the tenants organised for him was a wonderful end to a memorable weekend. At the age of 17 years, Mr Crawley joined the Royal Navy and started his training at HMS Collingwood near Fareham before joining HMS Rodney in Liverpool. On board HMS Rodney, Mr Crawley took part in the transport of the 51st Highland Division from the Clyde to Cape Town and Durban in 1942. The 51st Division, which had been the last line of defence at Dunkirk, were needed in North Africa to join in the fight at El Alamein against Rommel's Africa Corps. This convoluted route was due to the U-Boat menace in the Mediterranean. He also saw action in Operation Pedestal in 1942 which was providing much-needed supplies to Malta which was under constant threat from the German Navy and Luftwaffe. During the operation, five of the nine tankers his ship was escorting sank along with two other warships. After volunteering to join the submariners in 1943, he served on various submarines, patrolling off Port Vendres, Toulon and Marseilles. He received many honours during his career, including the Atlantic Star and Bar, Malta Medal, Italian Star and Submarine Service award. He returned home and while serving in HMS Elfin, Blyth’s depot ship, he met his future wife, Freda, whom he married in 1945. Mr Crawley was discharged from the Royal Navy in February 1946 and settled in the North East, where he has since lived. Anyone wanting more information about Holly Court, can contact 0800 731 2020.